Meetings need to be organized to ensure that results will be favorable for everyone involved. 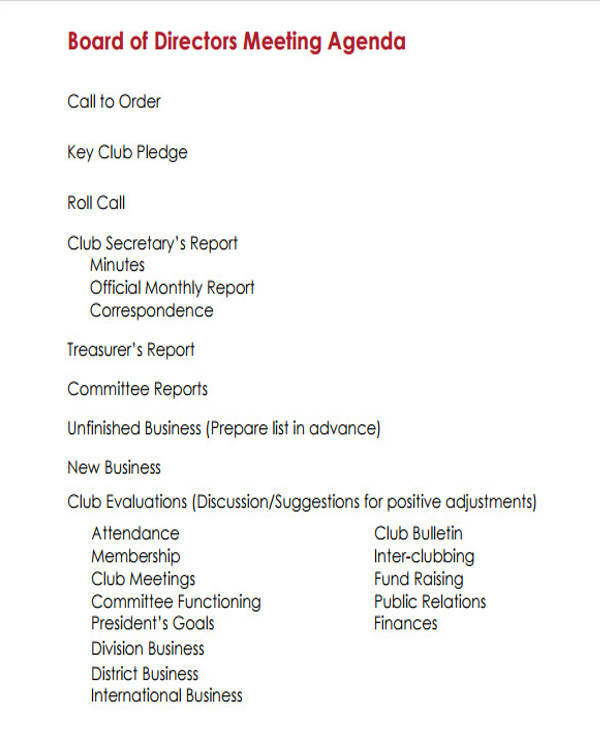 With that being said, organizing meetings will be very easy with the help of meeting agendas. With the help of meeting agendas, you will have an accurate and precise guide because your meeting agenda will reflect everything that you will need to discuss during the meeting. This way, meetings will be more focused and the likelihood that you and your colleagues will stray off topic can be avoided or can be minimized. This means that you will be able to save a lot of time. In this article, we would like to give you an in-depth discussion about what you need to know about meeting agendas. 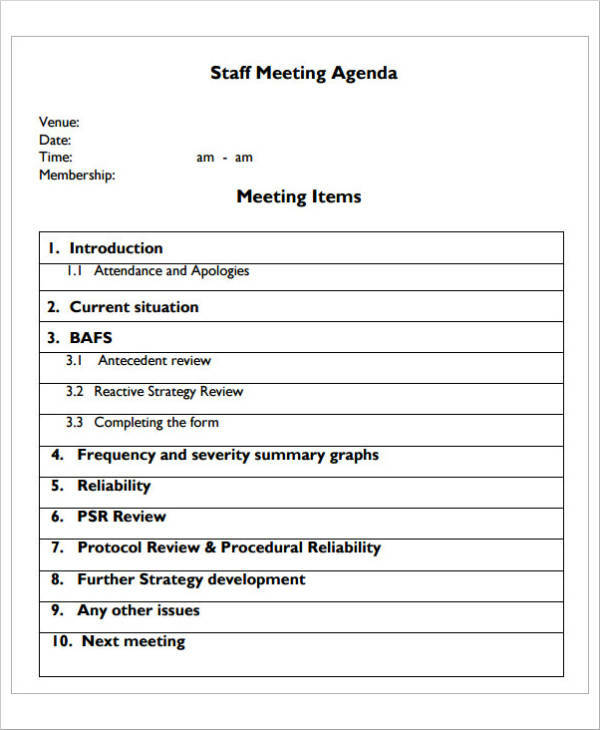 We will also be including some meeting agenda samples and templates for you to refer to get a better grip of what we will be discussing, plus it will serve as a good guide for you to follow should you need to come up with your very own meeting agenda. 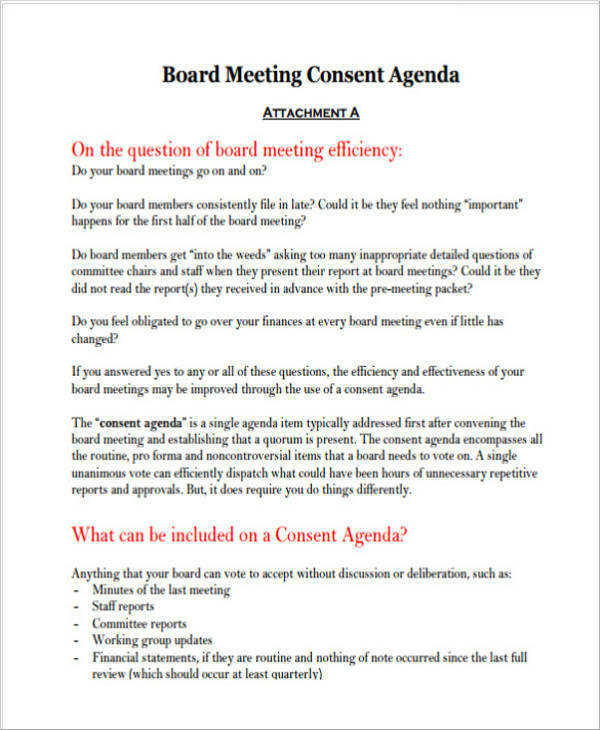 If you are ready to find out more about meeting agendas, make sure that you keep scrolling down! Let’s go! 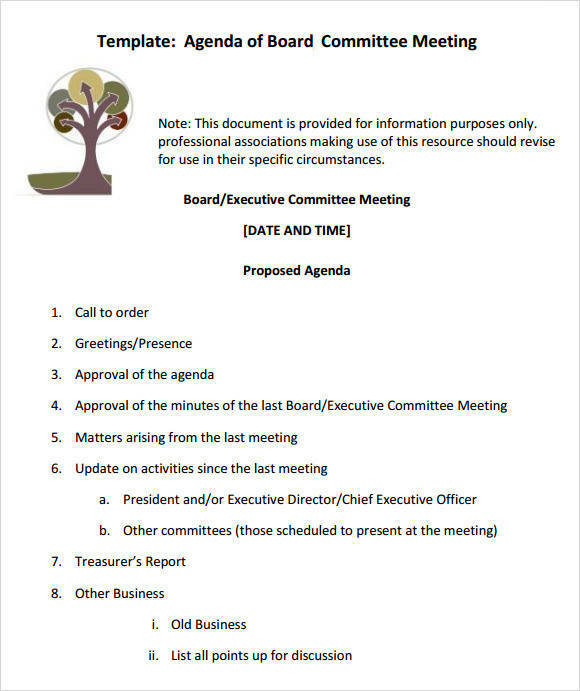 Basically, a meeting agenda is a list of the activities that will be discussed during the meeting. 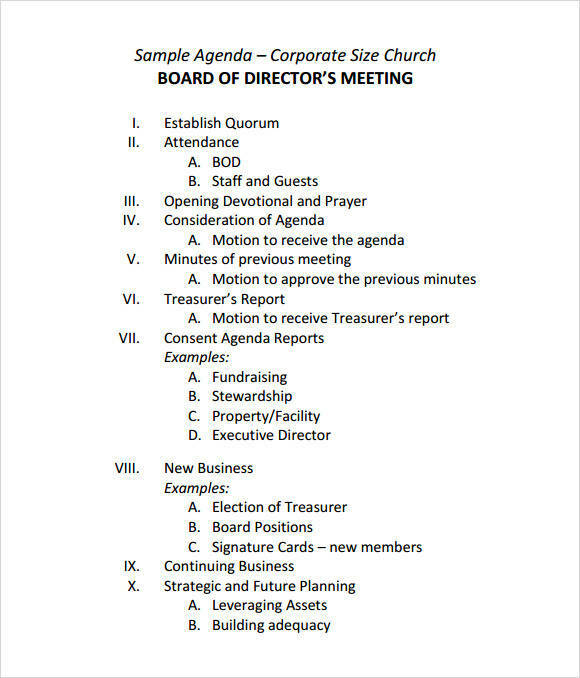 They are listed in sequence to ensure that the people involved in the meeting know what needs to be prioritized. 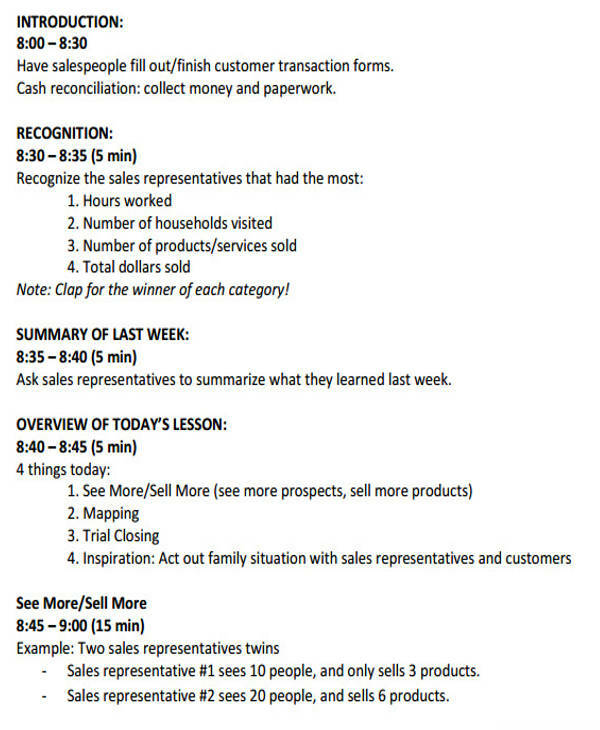 It begins with a call order and ends with the conclusions or call-to-action. They are usually written in a very specific manner to ensure that everything will be accounted for and that no details will be left out—especially the important ones! 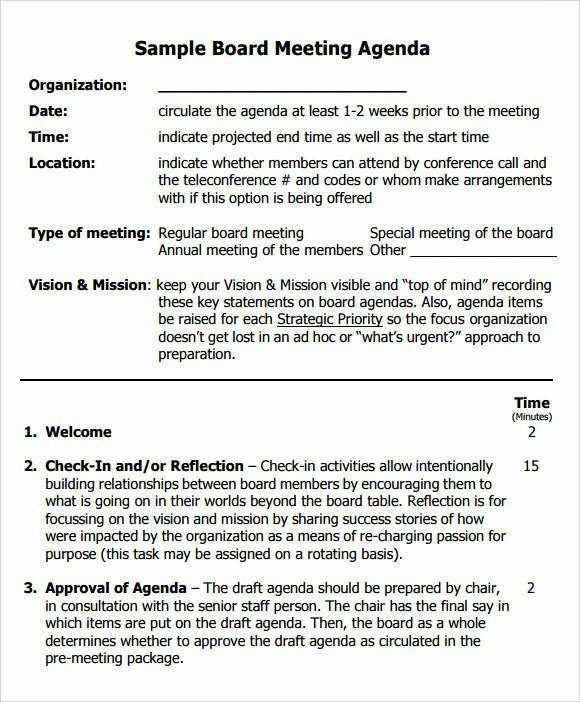 Another purpose of a meeting agenda is the fact that it serves as a notice for the participants about the meeting as it is given in advance. The participants or the people involved will already have a good gist of what will be discussed since all the topics are listed down on the agenda. This way, it gives the participants time to prepare the materials that might be needed during the meeting. 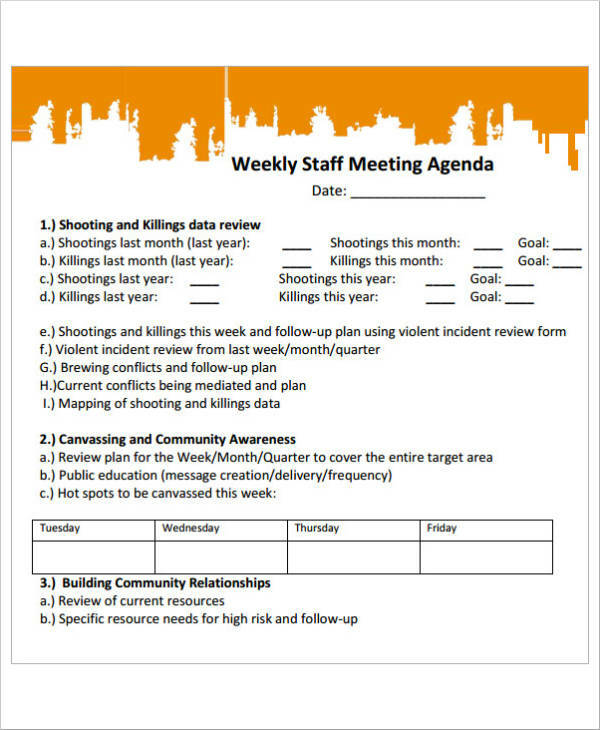 You may also see weekly agenda samples. Moreover, once the meeting starts, a meeting agenda will help to make everyone involved focused on what the meeting will be all about instead of discussing items that are not related or relevant to the meeting. More often than not, meeting agendas may include a time limit for each topic that needs to be discussed. You can find out more about the effectiveness of using meeting agendas by reading How Meeting Agendas Result in Actionable Productivity. Every meeting is unique. To ensure that you are coming up with an effective meeting agenda, you want to make sure that you know the type of meeting that will be conducted. There are many types of meetings out there. However, there are six common types of meeting agendas. 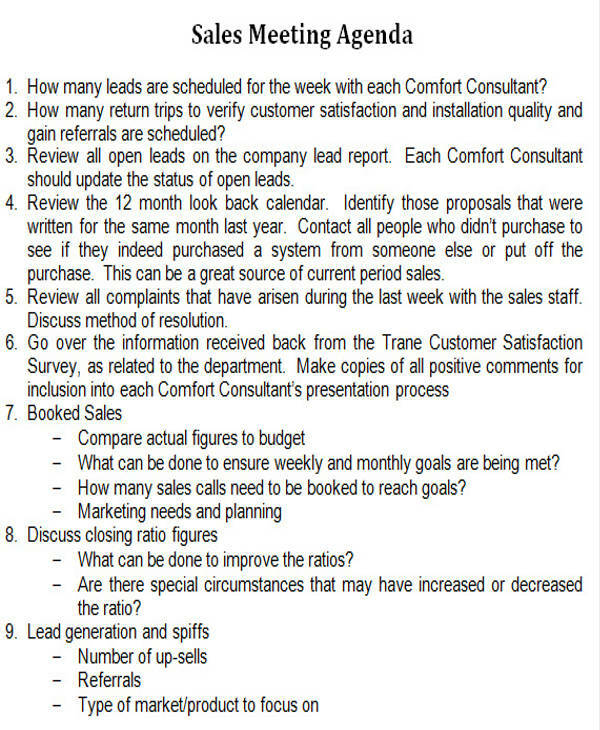 In this section, we would like to give you a quick breakdown of these types of meetings. From its name, status update meetings are meant to give everyone involved in the meeting an update about ongoing projects and tasks. Status meetings are usually done on a regular basis and are meant to let everyone know what the progress of the project is, what are the struggles along the way, and what are the next few steps to be followed. This type of meeting also helps to solve any problems, what needs to be prioritized, making good decisions for the project, and to remind people what their assignments are, and to ensure that everyone will stick to the plans intended for the project. 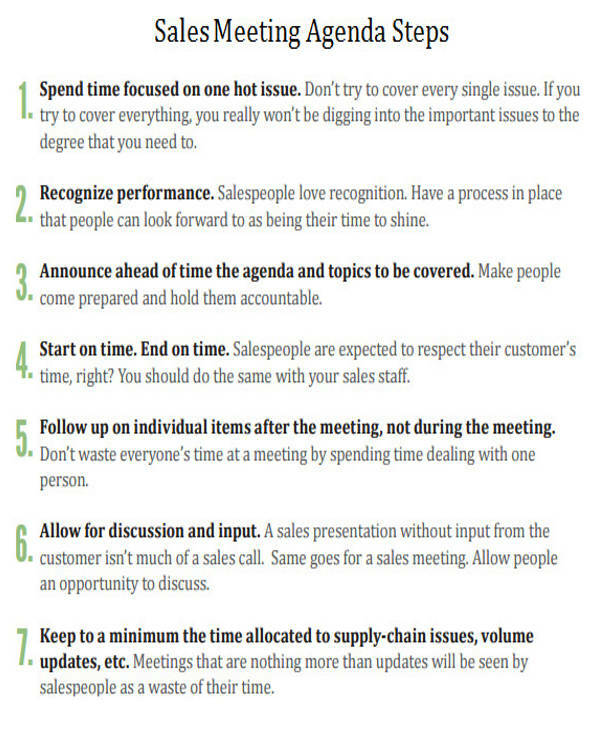 You may also like dos and don’ts of meeting agendas. 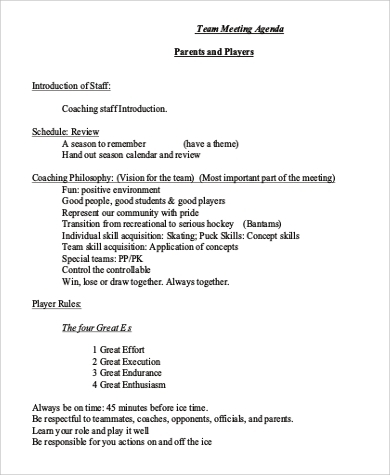 in-depth information about specific areas in the organization. When information sharing meetings are conducted, visuals are typically used to ensure that everyone has a good gist of what is being discussed. Visual tools can include AV presentations, slide presentations, or whatever visuals is deemed to be applicable to the meeting. You can check out our article on Keynote Presentations for more information about how you can go about your presentations. voting for the best option. To come up with the best decisions during your meeting, you can make use of a decision tree to map out your options and come up with a decision. More often than not, problems are usually encountered in an organization. There are many ways regarding how problems can be solved and one of these is to conduct a meeting with people in the organization and through this meeting, you can come up with a resolution. During this meeting, you want to make sure that priorities have been set. Identify the SWOT (strengths, weaknesses, opportunities, and threats), brainstorm and evaluate options in order to properly address the problem at hand. For more information about SWOT, you may want to check out What is SWOT Analysis? Brainstorming and thinking outside the box is key to coming up with innovative and creative ideas. By conducting innovation ideas, it allows everyone to come up with a short list of innovative ideas and focus on this short list. The short list can be ranked and evaluated in order to come up with a decision that everyone involved agrees on. Once you have come up with an innovative idea, it is now time to assign tasks and come up with recommendations. A research agenda might help you get those ideas. other activities that promote team building. These activities typically aim to make every member of the organization feel important and wanted as it has a positive impact regarding how they engage with their teammates, job performance, and job satisfaction. 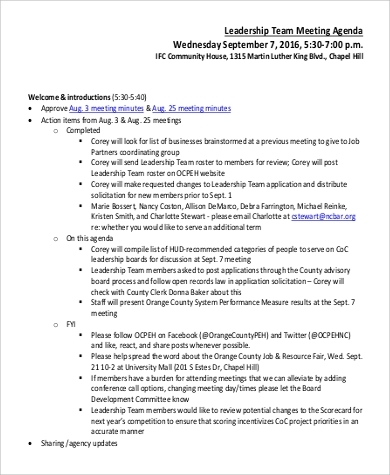 You might be interested in team meeting agenda samples. A well-thought-of business meeting agenda will help you to run an effective and efficient meeting. 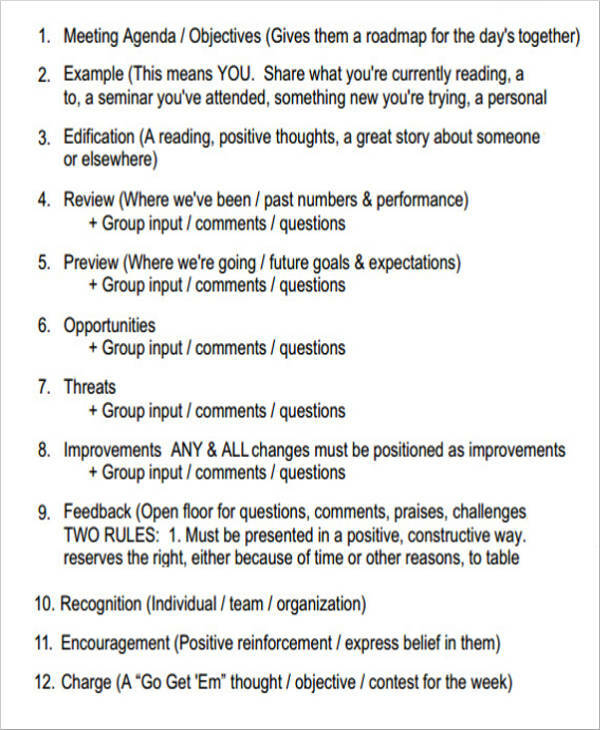 Preparing ahead is key when it comes to agendas. 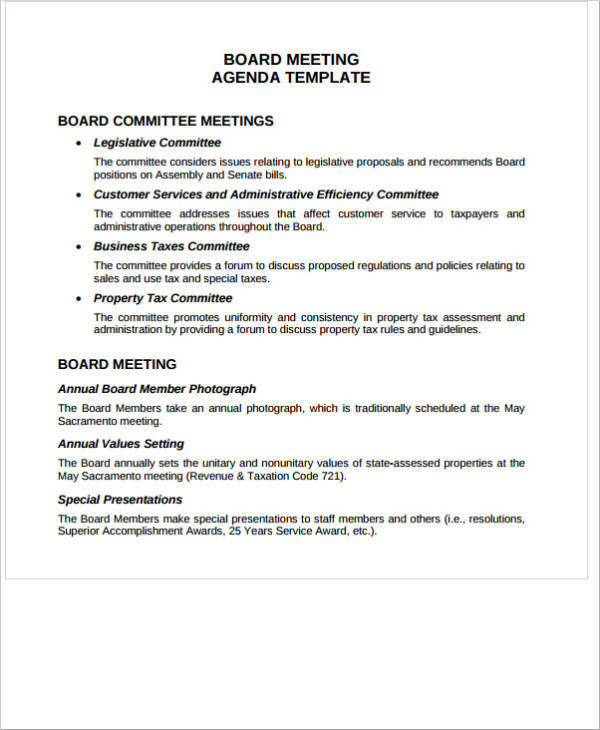 This is because agendas will help to save everyone time as everyone can come to the meeting prepared and can also help everyone focus on what needs to be discussed as it is listed down in the meeting agenda. But how can you come up with an effective meeting agenda? What should you include? This is what we will be discussing below. 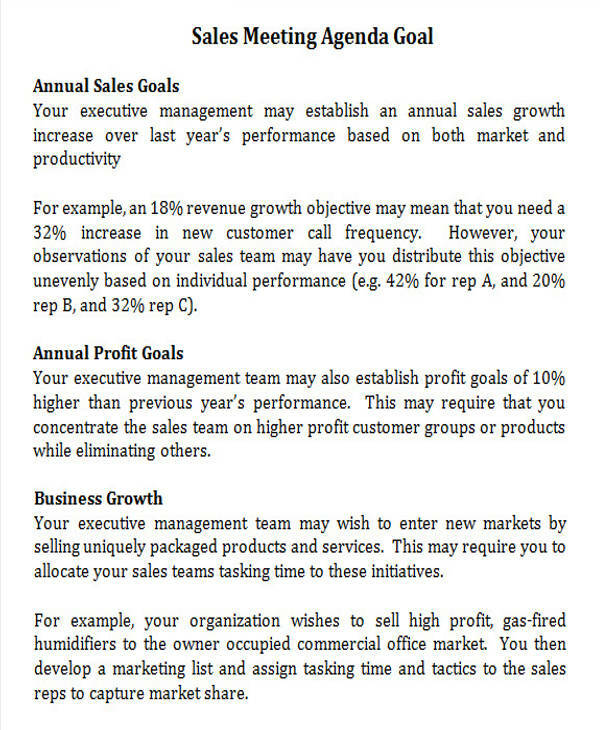 Your goals specify the main purpose of your meeting, so you want to remember that when you come up with your goals, you define it in a detailed manner especially since this is considered to be the most important part of your agenda. Your goals will help to provide everyone a good understanding of what the meeting is aiming to achieve as well as the reason why everyone in the meeting is considered to be valuable. Your goals will also help to ensure that the project or the purpose of the meeting is going to continue being on track. With that being said, should there be any complications along the way, finding a way to overcome the complications that may come along and improve the efficiency in performing the tasks. 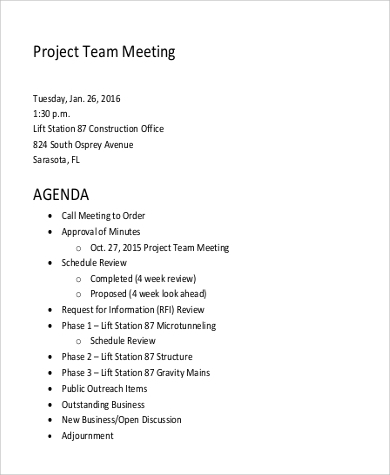 Take a look at project agenda samples. Once you have already listed down all of the goals that you want to achieve, make sure that you list down all of the topics that you will need to discuss in order to achieve the goals. Your list can either be long or short—it all depends on the methods and processes that you will need to include to achieve your goals. When you are listing down your topics, the sequence can either be based on a timeline or deadline, which ones are of high priority (high priority to low priority items), or which tasks are easier (easy tasks to more complicated or vice versa). Whatever the sequence of your topics may be, you want to make sure that you consider the capacity of the team. If you are unsure of the final sequence of tasks or topics, you may want to ask everyone involved which topic they would like to tackle first. 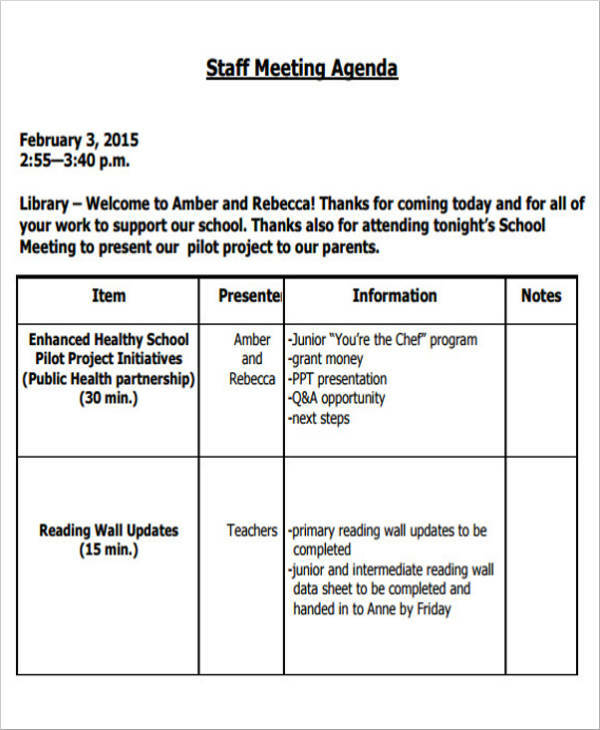 You may also see sample staff meeting agenda templates. Thinking who to invite during the meeting is just as important as thinking about who you should not invite during the meeting. Remember that you should only invite those who are really needed in the meeting. But how would you know who is needed in the meeting? 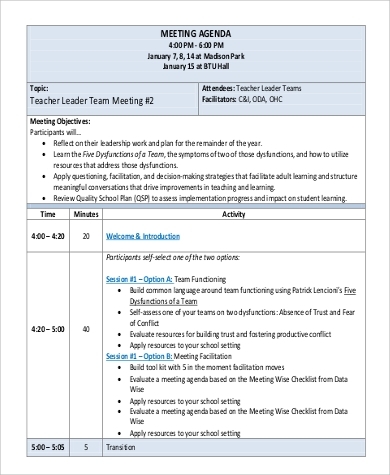 You may also like sample school agenda templates. Will he/she be an important individual in terms of achieving the goals of your meeting? 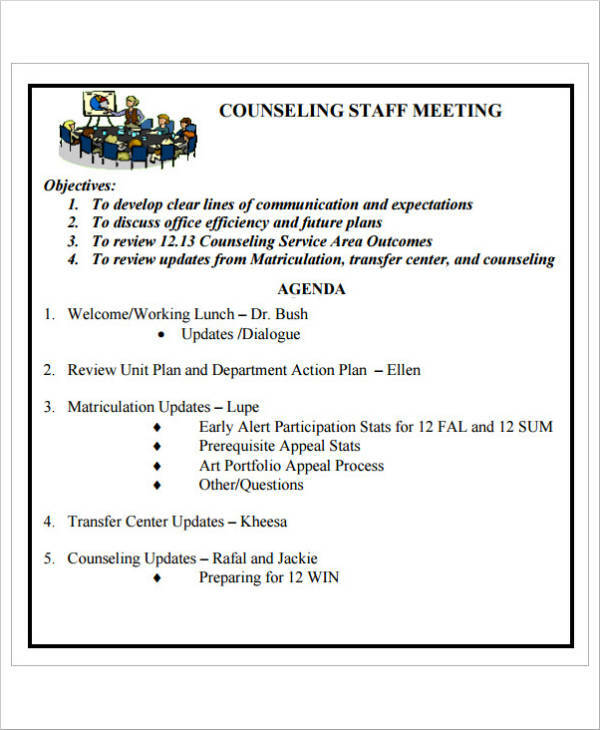 Will he/she be able to contribute or give key information that will affect the outcome of the meeting goals? Is this individual directly affected by the conclusion or the end result? Once you have answered the questions and you are still unsure whether or not you should invite the individual, you may indicate that his/her attendance is optional and you may also send an email of the summary or the meeting minutes to such individuals that you are unsure of. Always remember that you should be considerate of your colleagues’ time and effort. 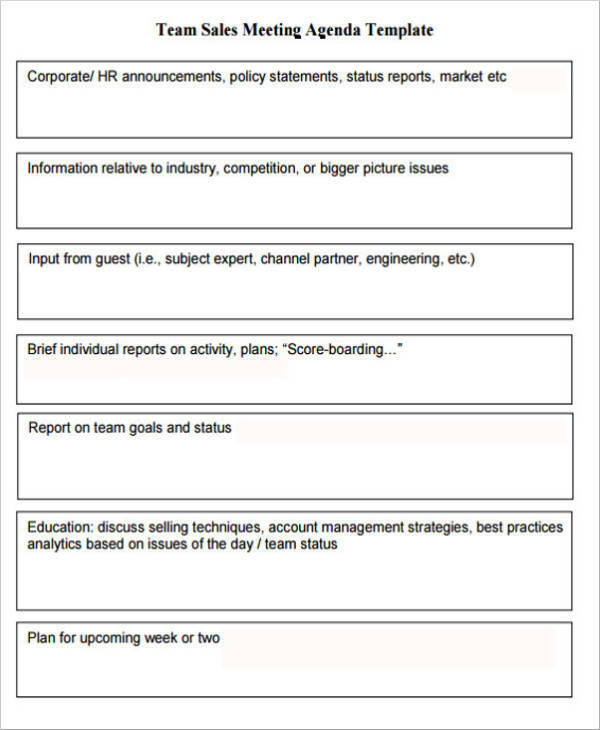 More often than not, people in a meeting tend to stray from the topics that are to be discussed, so you want to make sure that you include a section or a space at the bottom of the agenda that will be dedicated for the items that have been discussed that are not related to the listed topics in the meeting agenda. 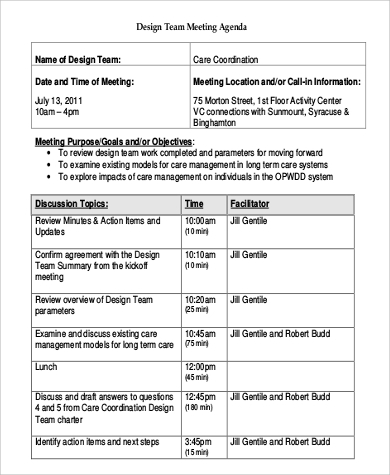 You may also check out event agenda samples & templates. 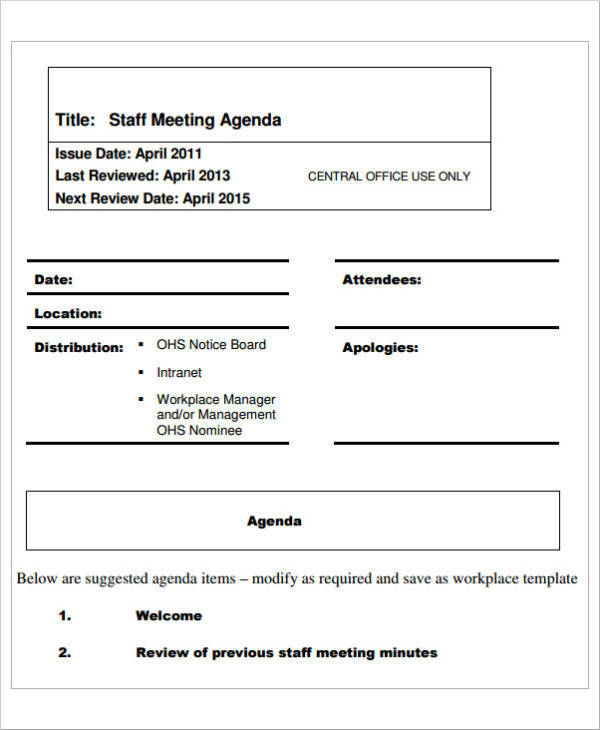 Having space at the bottom of your agendas can also give the participants an avenue for them to take down notes regarding the meeting should they want to do so. Whether your participants are going to join your meeting remotely or physically, these details are important. If your meeting is going to be a physical one, make sure that you include the time and location where the meeting will be held. If your meeting is going to be remote, you want to make sure that you include the platform that will be used for the conference meeting (Skype, Google Hangouts, FaceTime, etc.) and you want to make sure that the time is accurate especially if the individuals included during the conference meeting are located in states or countries with different time zones. You might be interested in school agenda samples. 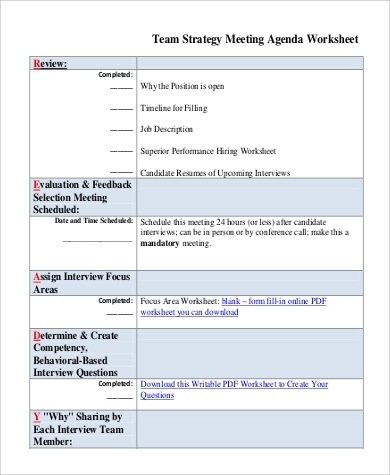 Once you have all these details plotted on your meeting agenda, you can now start sending these out to the participants. However, remember that you should send the meeting agenda ahead of time. A 24-hour to 48-hour window would be great. This way, you give your participants ample time to prepare everything that will be needed for the meeting. 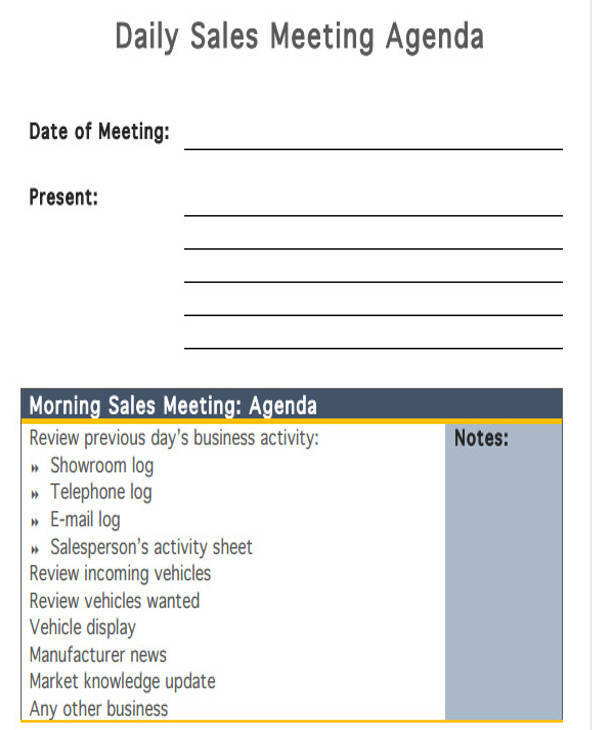 Need more information regarding business meeting agendas? We have a couple of Business Meeting Agendas for Small and Medium Enterprises for you. Check them all out.